Durable and reliable trigger mechanism is basic premise for a successful upgrade sniper rifle. Stock supplied trigger mechanism is sufficientfor basic springs. But when you use stronger springs, significantly increases possibility of the damage. Unfortunately you can`t avoid this even with cheap alloy triggers. Only steel machined mechanism can ensure the greatest durability. Tested on springs up to M190. Inner parts can be used in original Well triggers. Easy to install under two minutes. Link to the video installation guide in HD resolution on each packing. Complete set is designed and manufactured in the Czech Republic. Partial technical solutions are protected by copyright! This high quality trigger set is dedicated for Well MB01, MB04, MB05, MB08, MB14..etc with the classic 90° piston catch. You can use it for stock Well or any custom upgrade pistons and cylinders. 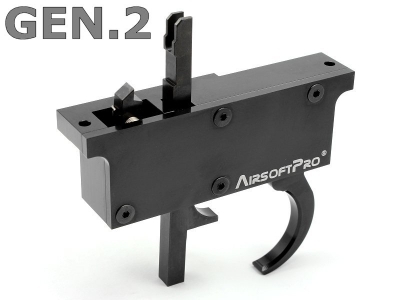 Not fit on guns with 45° piston catch like MB02, MB03, MB06, MB07, MB10, Bar10, VSR10, series MA44xx..etc. Not suitable for M24.